They are one of our most common and widespread mammals, but few people will ever see a live mole. I think this is a shame, as they are fascinating creatures, perfectly adapted for their subterranean lifestyle. I haven’t yet seen a live mole, so don’t have any photos to show you. 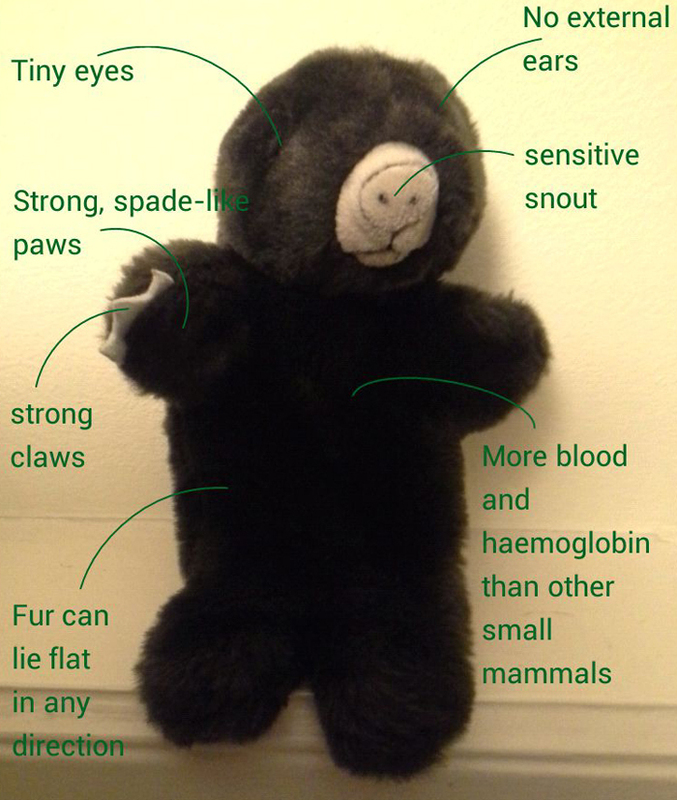 Luckily my friend Moley has agreed to help show you what makes moles so great. Talpa europaea, the mole we get in Britain, is surprisingly small in real life, usually between 11 and 15 centimetres long, with a short tail. Moles are insectivores, and have a long, pointed, mobile nose like hedgehogs and shrews. The sensitive hairs on their noses help them to detect food. Their favourite food is earthworms, bit will eat other insects (and sometimes other small creatures as well). Sight isn’t all that useful in dark tunnels, so moles have tiny eyes (1mm across), but they can tell the difference between light and dark. This may be to help them detect when intruders break into their tunnels from above. Moles don’t have external ears (presumably because they’d just fill up with mud). Moles are usually dark furred, like Moley. But as colour doesn’t matter too much in dark tunnels, other colours (like white or light brown) are not uncommon. Their fur is short, velvety, and can lie flat in any direction, to help them back up through narrow tunnels. Digging is what moles do best. Their powerful, spade-like front paws help them shift lots of earth quickly. A mole can dig around 20m of tunnels each day. Moley, being bigger than most moles, assures me he could manage 30m easily. There is less oxygen in the air of underground tunnels than above ground. To make up for this, moles have more blood than other similar-sized mammals, and twice as much haemoglobin (which carries oxygen in the blood). Moles leave obvious signs of activity, creating mole hills from the spoil from their tunnels. This makes them unpopular with gardeners, but unless you’re tending a lawn for competitive bowls, croquet or tennis, I can’t understand people wanting to kill moles. It’s easy enough to rake the molehills away. Their tunnels also help aerate the soil. Moles spend most of their lives below ground, but they do sometimes come up to the surface. Your best chance of seeing one is in June, when youngsters are heading off to find their own territory. I hope that I will get to see one someday. It’s been a while since I wrote the last British Animal Challenge update – back in the long, hot days of August. Now the clocks are about to change, and there’s been a lot of rain, so spending time outdoors is less attractive. I had hoped to see some new bats and cetaceans in September. Sadly I wasn’t able to identify any new bats, and didn’t see any dolphins or whales. My second attempt at seeing water shrews was unsuccessful. But I did see a stoat. As the Scots voted ‘no’ to independence, my list hasn’t reduced, but the Jersey Toad has been a small addition. In November I’m hoping to see some harvest mice, and maybe some other small mammals. One of the things I love about monitoring dormice is the way they frequently surprise me. When I first started learning about dormice I was amazed at how much we don’t know about them. Through projects like the National Dormouse Monitoring Programme we’re learning all the time, and it’s great to be able to contribute to this research. Sometimes I think they deliberately set out to prove the textbooks (and me) wrong. Although October is usually a good month for dormouse monitoring, I wasn’t expecting to see any at the site I helped with this month. No dormice were found in the previous few checks. I was prepared for a pleasant but mouseless scramble round the woods. I was very happy to be proven wrong. We found six dormice, all of decent weights (although none were very chubby). For some reason, they were all in pairs this time. Dormice aren’t supposed to be social animals, at least when they’re adult and not-breeding. We had a box with a male and a female, and two boxes with two females in. All adults. It’s not like there weren’t plenty of other empty boxes to choose from, if they’d wanted some peace and quiet. Another thing dormice are supposed to not do is take food into their boxes. Unlike woodmice who cache nuts, dormice tend to eat outside where they find the food. Once again the contrary mice were intent on proving the experts wrong, as we found a nut nibbled by a dormouse in an otherwise empty box. The nibbled nut had since been taken over by a spider. Apart from the dormice it was a quiet box check. No wood mice, yellow-necked mice or shrews, and of course the birds finished nesting a long time ago. That may well be my last check for the year, depending on how cold it gets over the next month. The dormice will soon start constructing their hibernation nests, down on the woodland floor (or at least if they’re following the advice of the text books they will). Time for me to start working on something similar? My British Animal Challenge list has just got a little longer, as last week it was announced that the toads found on Jersey are actually a separate species to those found in mainland Britain. News hot off the press: a new non-native invasive species has been discovered in Britain. This time it’s a small mussel, called the quagga mussel. It was spotted in Britain for the first time in Staines earlier this month. The quagga mussel looks innocuous enough. They are much smaller than the type you get served in a moules mariniere. But they can cause lots of damage to the river biodiversity. They filter out lots of nutrients used by algae that compete with the notorious blue-green algae, allowing the toxic blue-green algae to flourish. The mussels can also cause damage to pipes and boat propellers by attaching themselves in great number (up to 10,000 per square metre) to them, causing blockages. They can alter the whole ecosystem. There is no effective way of controlling or eliminating them once they are established, and they spread very quickly. This makes tackling the problem now, and preventing further spread vital. So what can we do? Firstly, we need to look out for them, and report them if we find them. You can find details of how to identify and report them on the Non-native Species Secretariat website. The small army of river wardens in Surrey are on alert, and will be watching out for them when we do our next walkovers along the rivers Wey and Mole. We’re not that far from where they were found, so vigilance is important. 3) Dry all equipment, and make sure you don’t transport any water. You can read more advice about stopping the spread of the quagga mussel here. I’ll let you know if I spot any on the River Mole next time I am Riversearching. I’m a planner. I like making detailed plans, based on thorough research. This works for seeing some animals: working out where to go and when, and what to do when you’re there. Others you can’t really plan for – you need to be lucky. So far in my British Animal Challenge I have focused on animals I can more or less plan to see. I have done my research, and gone to likely places, (as with water voles) or, even better, joined in surveys to find them (as with newts). Of course, even going to places you know the animal frequents doesn’t guarantee you a sighting (see my water shrew and otter attempts). When I was looking through my British Animal Challenge list, working out how to see every type of British animal, there were some where my conclusion was I’d just have to spend enough time in the right sort of habitat to eventually see one. Stoats were like this. They are not particularly rare, and quite widespread, but going out deliberately to see one may be tricky. So I was delighted to get a glimpse of one as it dashed across the road as we drove in Dorset. Stoats, like otters, badgers and weasels, are members of the mustelid family. They have long, thin bodies, and move with the flowing gait that seems unique to mustelids. My glimpse of stoat reminded me of the value of just spending time in wild places, even if I’m not on a particular mission to see something. You never know what will cross your path. As you cross the Tamar Bridge, you know you’re entering Cornwall by the large crest displayed proudly. The Cornish crest features, among other things, a chough. Yet for years the crest was the only place in Cornwall where you could see a chough. Choughs are members of the crow family, with distinctive curved red beaks. They eat insects, and hunt for food in the short grass of grazed coastal areas, where insects are easy to come by. They’re known in other parts of the UK as Crows of Cornwall, and are part of some of the legends about King Arthur (whom some claim lived in Cornwall). The population of choughs in Cornwall declined from the nineteenth century until 1973, when the last, lonely, survivor died. The Cornish national bird was no longer Cornish. The decline is thought to be partly due to changes in farming practice, with livestock being moved further inland, allowing scrub to develop on the ungrazed cliff edges. Then, in 2001, 3 choughs from Ireland found their way to Cornwall, settling on the tip of the Lizard peninsula. The next year two of them paired-up and bred, bringing up Cornish-born choughs for the first time in decades. The small colony of birds has been gradually expanding each year, through breeding and the addition of a few more immigrants. A committed band of volunteers have been keeping a close eye on the birds to protect and monitor the nests. You can read more about their work, and this heartening story, on the excellent Cornish Choughs website. Last week I visited the Seal Sanctuary at Gweek (such a fun place name to say – give it a go!). I got to find out a bit about their work rescuing and rehabilitating seals. The Sanctuary rescues seals in need, provides hospital care for them, rehabilitates them, and, all being well, releases them back into the wild. It also provides a home for those that wouldn’t survive in the wild. We’re at the start of the pupping season for grey seals in the UK. So far the weather has been very good, but when the weather turns stormy some pups may need help due to injuries, illness or being separated from their mothers. The Sanctuary is enjoying a brief respite from the busyness of dealing with summer visitors, before the rescue season really gets going. Only one pup was at the hospital when I visited, but give it a month or two and the hospital is likely to be crowded. I’m a big fan of seals. I’ve had the privilege of snorkelling with them several times, and it’s amazing seeing them in the water. So rescuing poorly seals sounds like a good thing to me. With any wildlife rescue and rehabilitation, there’s always a concern about how the creature will cope when released back into the wild. Is their recovery complete? Have they lost a healthy fear of humans? And especially if they’ve been rescued as youngsters, will their instincts kick in and help them to hunt, navigate, and do everything else they need to? I was particularly interested in a poster displayed at the Sanctuary, reporting outcomes from seals they have released back into the wild. It was very encouraging to see that rescued seals can go on to thrive back in the wild. Some have crossed the channel to France, or been sighted off Ireland or the Scilly Isles, so they clearly haven’t lost their swimming ability. Some females have successfully bred following release. This seems like a good reason to support the Sanctuary to me, so if you’re in Cornwall, why not pay them a visit? My parents have recently moved from south Devon to the Lizard peninsula deep in Cornwall. While, as a patriotic Devonian, I was a little sad I’ll no longer be able to visit them in that beautiful part of the country, I’ve been quite excited by the possibilities of a new territory. I didn’t even wait for them to unpack before coming for a visit. My first day there I had a quick recce of the garden, to see what wildlife signs I could spot. Apart from the Rookery, there weren’t obvious signs of anything exciting. But night transforms things, so I set up my camera trap in a promising spot, and, once it was dark, headed out with my bat detector. Once again I picked up a species I couldn’t identify, and some more pipistrelles. While we were out bat detecting, Dr C heard a snuffling sound, and, expecting to see a hedgehog, turned his torch onto the front lawn. In fact, it was a badger. I haven’t seen a badger for years, so it was very exciting. We were only a few metres away, but it didn’t seem too concerned, and finished its snuffling before disappearing up the road. This made my day. The next night we got back late, driving past a badger on the road, then spotting another under the apple tree in the back garden. The night after, coming back from the village, we disturbed 3 badgers, who dashed off from under the apple tree. Sadly, despite all the sightings, I haven’t managed to get a photo of them. I had packed light and not brought my flash with me, and while they did trigger my trail camera, the infrared seems to have broken, as all the clips are black. This is very frustrating, but at least I have had good views of them. It seems like badgers are regular visitors at the moment. I am not sure what they are eating there, as there are no signs of them digging up the lawn for leatherjackets, and the ground was dry, so it can’t be earthworms. Are they scrumping the windfall apples?